This year’s Chelsea Flower Show has just come to an end. No Korean participation this year, as far as I am aware. 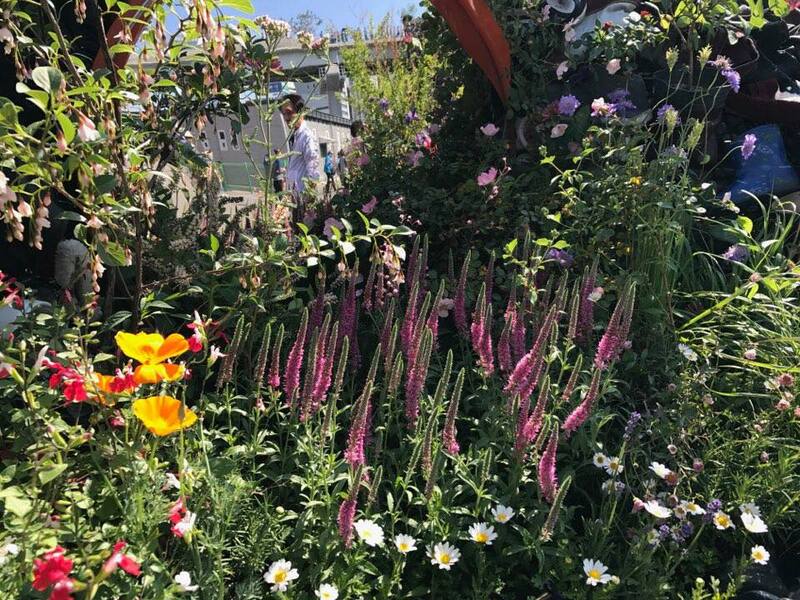 Last year Hwang Hay-joung won silver gilt for her Smart Garden sponsored by LG. But loyal readers will remember back to 2011 and 2012, when Hwang Jihae, without a big name corporate sponsor, won gold medals for her art, which in 2011 recreated a romantic view of a rustic privy and the following year turned to the Korean War for its highly emotional inspiration which won her the President’s Award, a discretionary prize in the gift of the President of the Royal Horticultural Society. Both gardens – which have now been installed in the Eco Park on the shores of Gwangjuho Lake in South Korea – have some common themes: a planting scheme that fools viewers into thinking that they are looking at a piece of nature that has been there for decades; a meticulous attention to the most microscopic detail; a lack of regular geometry which means there is no perfect angle to view the garden – instead you are drawn into it and forced to move around and enjoy all those details; and a use of found or recycled objects. Hwang describes herself both as a garden designer and environmental artist, and her installations are always designed to challenge. For her latest work, roughly coinciding with Chelsea, Hwang has created a work featuring around 30,000 old shoes. The commission, which is said to have cost the Seoul Metropolitan Government over 100 million Won to install, but in which Hwang’s participation was pro bono, is to celebrate the opening of Seoullo 7017, the new garden walkway created from a traffic overpass near Seoul Station. Inevitably, Hwang’s work has drawn mixed reactions, particularly during the construction phase when the artistic vision was less clear to onlookers. At Chelsea, designers construct their gardens behind the closed barriers of the show ground, but Hwang’s Shoes Tree was work-in-progress in full public view: “I feel like people are peeking in while I’m in the middle of a shower,” she said at a press conference several days before the work was finished. “예술품이 반드시 예뻐야하는것은 아니다” (“Art work doesn’t always have to be pretty”) said Seoul Mayor Park Won-soon at the opening ceremony on 20 May – the day when Seoullo 7017 itself had its official unveiling – but for many that defense of Hwang’s vision was not necessary. That weekend there was a special interactive event where visitors could select a shoe, fill it with soil and plant a flower in it. For some visitors, that was the highlight of the installation. The street that cars once drove down will now be a forest where people walk and insects buzz. 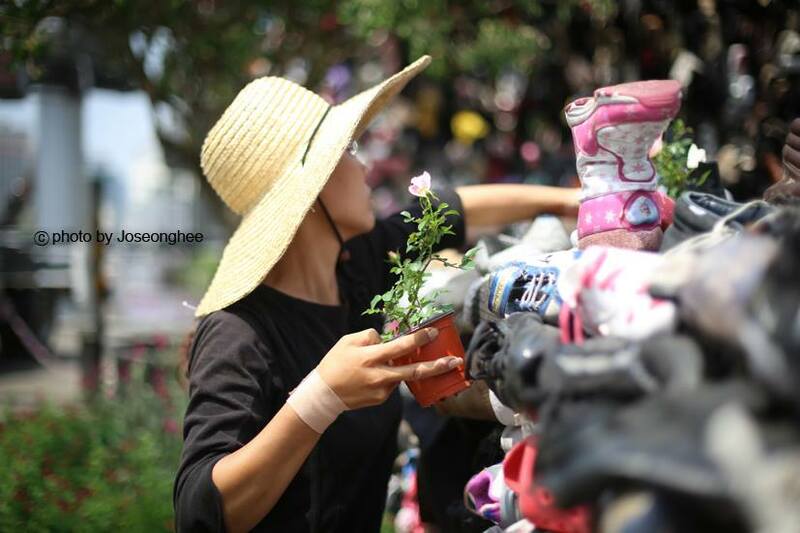 The “Shoes Tree” performance will convey the message of the Seoullo 7017 project during its opening event while respecting the basic theme of expressing the overpass through a single tree. By allowing city dwellers to participate in the creation of this work of art, the performance will represent, at least briefly, the values we have lost in the heart of the city and quietly proclaim that those values can be restored. The medium of shoes will be a conduit and a mass language pointing the way toward addressing the fundamental issue of urban society. The scale of the work is huge: one hundred meters long, the installation snakes along the ground, forming an arch (with shoe laces dangling down like tendrils in a rain forest) opposite the old entrance to the station, before climbing to a 17 metre peak as it scales the heights of the overpass. At night, the work takes on a whole new aspect, as thousands of LEDs turn it into something like a giant Christmas tree. 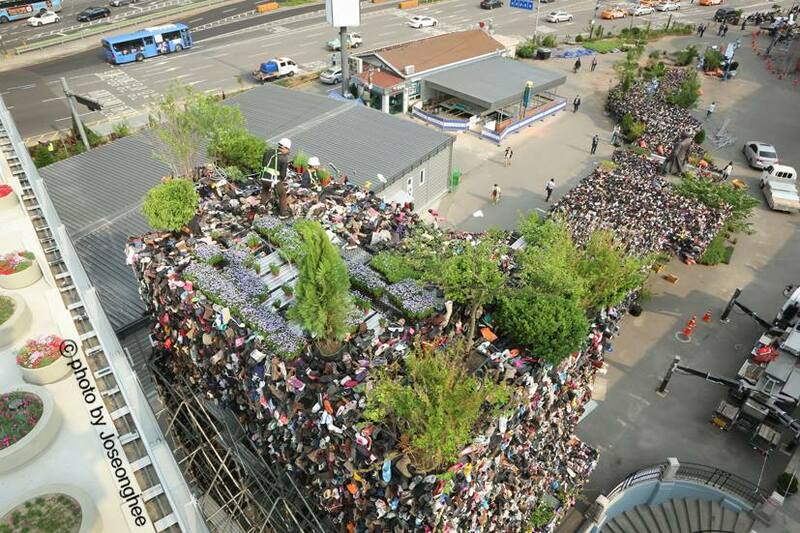 The work is scheduled to be dismantled after nine days “but we may keep it longer depending on how people feel about it,” according to the head of the Landscape Planning Division of the Green Seoul Bureau. Let’s hope it gets kept in place for a few more weeks at least: it often takes a while for people to appreciate something new, and as the plants grow the installation itself will change. If nothing else, it has filled an empty space with something visually interesting, stimulated debate on regeneration and the things we throw away, and has provided inspiration for hundreds of photographers. Among them, Jo Seong-hee, who used to be based in London and was an occasional LKL contributor, worked alongside Hwang documenting the progress of the installation. Thanks to Seong-hee, Jihae and also Kim Insoon for the photos that go with this article.